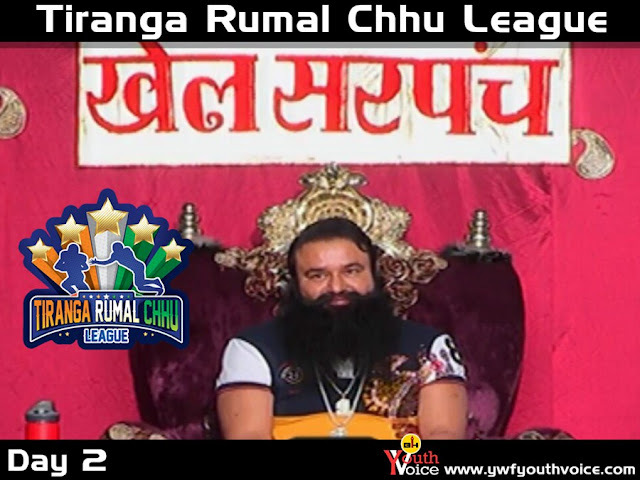 Tiranga Rumal Chhu League Day 2 News, results, photos and videos. Information about upcoming matches. This competition was neck to neck till the very end, Australia won with a negligible difference. Result: MSG Australian Brave Boys won. Man Of The Match: Anuj (MSG Rajasthani Soorma) and Monu (MSG Australian Brave Boys). Fans were so excited for this match, in first half both were equally good. In second half Haryana played far better leaving Punjab behind by huge margin. "69" is the highest score by any team till now, Haryana ne lath gaad diya. Result: MSG Lath Gaad De Haryana won. Man Of The Match: Pavan (MSG Lath Gaad De Haryana). All MOM were awarded with Okinawa Electric Bikes by Dr. MSG. TRL is receiving so much love from fans worldwide, don't forget to watch it tomorrow.